Ann Larkins (or Larkin) was my maternal 5th great grandmother. She was born sometime around 1730 to 1735 possibly in New Hanover, North Carolina. I don't have parents listed for her but some family trees on ancestry.com have her mother as Tobitha Jenkins, Canty, or Jones and her father as John Larkins. The Devane genealogy book that my mother has says Ann's name was Ann Robinson rather than Larkins. One family tree notes that her mother Tobitha remarried in 1738 after the death of John Larkins. This family tree gives Ann's birth year as 1740 and her parents as James Robinson and Tobitha Jenkins. Ann married John Devane, Sr., possibly in 1752 or 1753 and gave birth to nine children: Ann, George, Margaret, Rebecca, William, John (1755-1802, my 4th great grandfather), James (1757-1840), Thomas (1762-1831), and Tobitha (1764-1815). Her husband and several sons fought in the Revolutionary War. 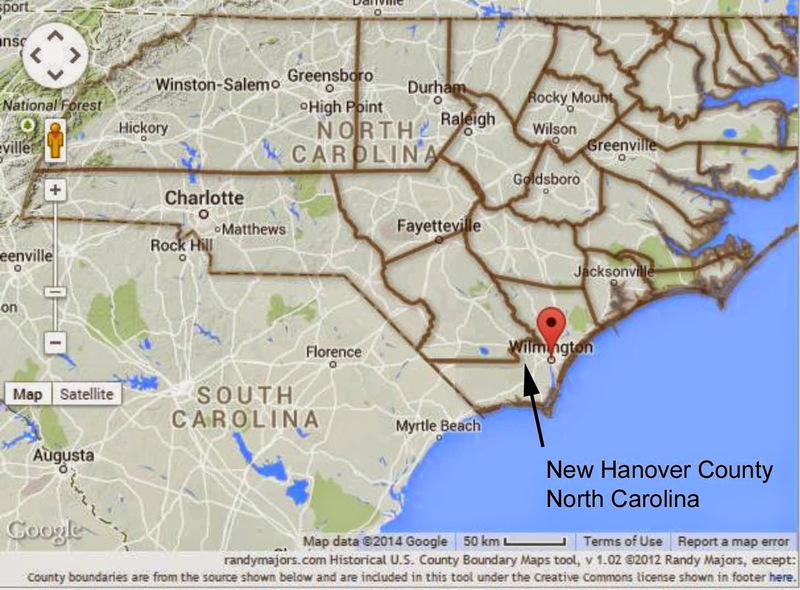 Both John and Ann died in Wilmington, New Hanover County, North Carolina. John died around 1806. Ann died about 1818. According to the Devane book, they are both buried under St. James Episcopal Church in Wilmington where John was vestryman. This church was torn down in 1839 and rebuilt, but I don't know if it was rebuilt in the same location or what might have happened to the burials under the church. According to an article by StarNews reporter Ben Steelman, some of the burials at St. James Episcopal Church were moved to Oakdale Cemetery which was established in 1852. Ann Larkins and John Devane Sr.
Ann Davis and John Devane Jr.
Leona Redles and Albert S. Pendleton Jr.
 Devanes 1798-1975, published by Kissam P. DeVane, Gilbert O. Maulsby, Woodrow W. Hancock, and Robert P. Jolley, n.d.
 Ben Steelman. "Where are the bodies buried?" StarNews. Electronic document, http://www.myreporter.com/2009/04/the-bodies-buried/, accessed December 22, 2014.